The System x3250 M6 offers a wide range of processors - from Intel Celeron to Intel Xeon E3-1200 v6. With support for a memory capacity of up to 64 GB and internal storage of up to 48 TB, the x3250 M6 is ideal for small- to medium-sized business, workgroups, distributed locations, and webscale workloads. This product guide provides essential pre-sales information to understand the structure of the System x3250 M6 offering, its key features and specifications, components and options, and configuration guidelines. This guide is intended for technical specialists, sales specialists, sales engineers, IT architects, and other IT professionals who want to learn more about the System x3250 M6 and consider its use in IT solutions. This Product Guide describes currently available models of the Lenovo System x3250 M6 with the Intel Xeon E3-1200 v5/v6, Core i3 6100/6300/7100/7300, Pentium G6100/6300/7100/7300, and Celeron G3900 Series processors. For withdrawn models of the Lenovo System x3250 M6 with the Intel Xeon E3-1200 v5, Core i3 6100/6300, Pentium G6100/6300, and Celeron G3900 Series processors, see the following Product Guide: Lenovo System x3250 M6 (Intel Xeon E3-1200 v5, Core i3, Pentium/Celeron G Series Processors). The System x3250 M6 offers a wide range of processors — from Intel Celeron to Intel Xeon E3-1200 v6. With support for a memory capacity of up to 64 GB and internal storage of up to 48 TB, the x3250 M6 is ideal for small- to medium-sized business, workgroups, distributed locations, and webscale workloads. Flexible and scalable internal storage configurations include up to eight 2.5-inch or four 3.5-inch drives with a wide selection of drive sizes and types. Also, it features integrated 1 Gb Ethernet NICs and additional PCIe expansion slots for advanced RAID protection and network scalability. The following figure shows the System x3250 M6. The Intel Xeon processor E3-1200 v6 product family improves productivity by offering 4-core processors with up to 3.9 GHz core speeds and up to 8 MB of cache to provide affordable single-socket system performance. Up to four 2400 MHz DDR4 ECC UDIMMs provide speed, availability, and capacity of up to 64 GB. With Intel Integrated I/O Technology, the PCI Express 3.0 controller is integrated into the Intel Xeon processor E3-1200 v6 product family. Such integration reduces I/O latency and increases overall system performance. Predictive Failure Analysis (PFA) in the System x3250 M6 detects when system components (memory and battery) operate outside standard thresholds and generates proactive alerts in advance of possible failure, thereby increasing uptime. Intel Celeron Processor G3900 product family with two cores up to 3.0 GHz, 2 MB cache, and up to 2133 MHz memory speed. Memory Four DIMM sockets. Support for ECC UDIMMs. Support for 2133 MHz and 2400 MHz UDIMMs. Mixing 2133 MHz and 2400 MHz UDIMMs is supported. Mixing SAS and SATA HDDs and SSDs is supported within a system, but not within a RAID array. 6 Gb SATA RAID: RAID 0, 1, 10, 5 with C110. Optional upgrade to RAID 5, 50 is available for M5210 (zero-cache; 1 GB non-backed cache; 1 GB, 2 GB, or 4 GB flash-backed cache). Network interfaces 2x Integrated Gigabit Ethernet 1000BASE-T ports (RJ-45 with the onboard Intel I350-AM2 controller; one port is configured as a dedicated or shared network/systems management port. Slot 1: PCIe 3.0 x8 (x4-wired); custom low profile, dedicated for the M1210 controller. Slot 2: PCIe 3.0 x8 (x8-wired); full-height, half-length. Power supply One 300 W AC (100 - 240 V) fixed power supply (80 PLUS Gold); or up to two redundant hot-swap 460 W AC (100 - 240 V) power supplies (80 PLUS Gold, Energy Star 2.0). Systems management Unified Extensible Firmware Interface (UEFI), Integrated Management Module II (IMM2.1) based on Renesas SH7758, Predictive Failure Analysis, system LEDs, Automatic Server Restart, ToolsCenter, and Lenovo XClarity Administrator. Optional IMM Advanced Upgrade for remote presence (graphics, keyboard and mouse, virtual media). Operating systems* Microsoft Windows Server 2012, 2012 R2, 2016, and 2019; Red Hat Enterprise Linux (RHEL) Server 7; SUSE Linux Enterprise Server (SLES) 11 (x64), 12, and 15; VMware vSphere (ESXi) 6.0, 6.5, and 6.7. Service and support Optional service upgrades are available through the Lenovo Services: 4-hour or 2-hour response time; 6 or 24 hours fix time; YourDrive YourData; hardware installation; one-year or two-year warranty extension. * Not all processors support all listed operating systems. Refer to Operating systems for details. The following tables list the Relationship models of the System x3250 M6. Product availability: Relationship models of the System x3250 M6 are not available in North America. § x in the Model number represents a country-specific letter (for example, the EMEA model number is 3633W1G). Ask a Lenovo representative for specifics. # Processor details: Quantity, model, core speed, memory speed, cores/threads, and thermal design power (TDP). * An optional 4-to-8 drive bay upgrade kit requires the installation of the M1215, M5210, or N2215 controller and the removal of the existing M1210 controller. † For models with the C110 or M1210 controller, only one PCIe slot (slot 2) is available for the installation of additional PCIe adapters. For models with the M1215 controller, no slots are available for the installation of additional PCIe adapters. ‡ An optional optical drive requires the ODD Cable Kit (00YE644). § x in the Model number represents a country-specific letter (for example, the EMEA model number is 3943W1G). Ask a Lenovo representative for specifics. * An optional 4 to 8 drive bay upgrade kit requires the installation of the M1215, M5210, or N2215 controller and the removal of the existing M1210 controller. Note: Power cables are not included; see Power supplies and cables for ordering information. The following tables list the TopSeller models of the System x3250 M6. † For models with the C110 or M1210 controller, only one PCIe slot (slot 2) is available for the installation of additional PCIe adapters. For models with the M1215 or M5210 controller, no slots are available for the installation of additional PCIe adapters. The System x3250 M6 server supports one processor. The following table lists the specifications of the processors that are available for the System x3250 M6. 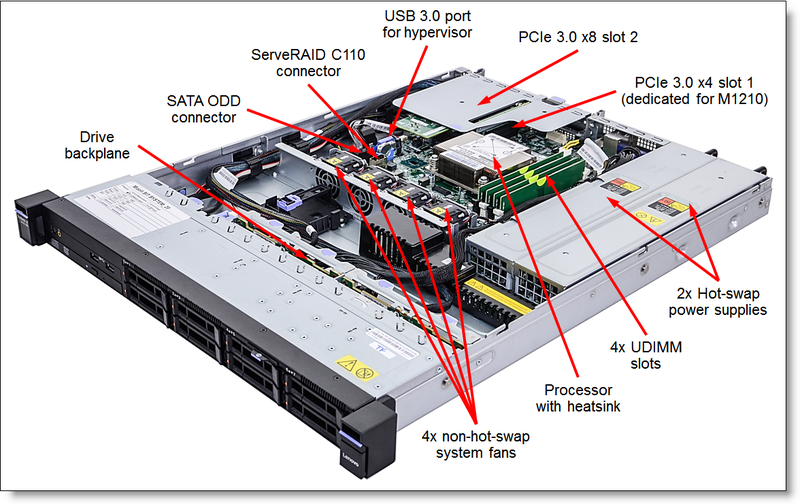 System x3250 M6 server models come standard with one processor. The following table lists feature codes for the processors that are available for the System x3250 M6. Lenovo DDR4 memory is compatibility tested and tuned for optimal System x performance and reliability. Lenovo DDR4 memory has a unique signature programmed into the DIMM, which enables System x servers to verify whether the memory installed is qualified and supported. Lenovo qualified and supported DDR4 memory is covered by Lenovo warranty, and service and support provided worldwide. The System x3250 M6 server has four DIMM slots, and it supports DDR4 UDIMMs with ECC memory protection. The processor has two memory channels and supports two DIMMs per channel. The server supports 2133 MHz and 2400 MHz UDIMMs. Mixing 2133 MHz UDIMMs and 2400 MHz UDIMMs is supported; however, all UDIMMs in the server will run at the same lower speed up to 2133 MHz. The server supports up to 2400 MHz memory speeds for one DIMM per channel and two DIMMs per channel configurations, provided that the processors and memory UDIMMs support this memory speed (see Processors and Memory for details). The following table summarizes memory speeds and capacities that are supported by the x3250 M6 server. The following table lists memory options available for the System x3250 M6 server. All server models of the System x3250 M6 support an optional optical drive. The following table shows the internal storage options available for the System x3250 M6 server. * Available in standard or CTO (configure to order) models, or both. * In the Storage controller column, RAID or HBA (PCIe 3.0 x8) means any supported PCIe 3.0 x8 controller for internal storage: M1215, M5210, or N2215. ** The x3250 M6 server models that use the ServeRAID C110 do not support an upgrade to a hardware RAID controller. The following table lists the storage controllers and the additional options used for the internal storage of the System x3250 M6 server. # ServeRAID C110 is an onboard hardware-assist, software RAID feature (Intel Rapid Storage Technology Enterprise [RSTe]) integrated into the Intel C232 Platform Controller Hub (PCH). *** One FoD upgrade enables the feature on all ServeRAID M1200 Series adapters (M1210, M1215) installed in the server. The onboard ServeRAID C110 controller does not consume a PCIe slot. The ServeRAID M1210 controller is supported only in the dedicated PCIe slot 1. Other controllers for internal storage (M1215, M5210, N2215) are supported only in the PCIe slot 2. The C110, M1210, M1215, M5210, and N2215 controllers are mutually exclusive, that is, only one of them can be selected in the configuration. Models of the System x3250 M6 that use the ServeRAID C110 controller do not support an upgrade to a hardware RAID controller. Important: ServeRAID C110 is not supported by virtualization hypervisors, including VMware vSphere (ESXi), Linux KVM, Xen, and Microsoft Hyper-V. The following table lists supported combinations of the storage controllers and drive types for the System x3250 M6 drive bay configurations. The following tables list currently available drive options for internal storage of the x3250 M6 server. The System x3250 M6 server supports the optical drive options listed in the following table. The Serial Port Upgrade Kit listed in the following table is used for mounting the external DB-9 serial port on the rear of the System x3250 M6. This option includes the bracket and the cable. The serial port is mounted in place of the PCIe slot 1, and the M1210 adapter cannot be used. * SFP+ based adapters require supported transceivers or DAC cables that must be purchased for the adapter (See "10 Gb SFP+ transceivers and DAC cables" in the table above). The following table lists SAS RAID controllers and HBAs for external storage attachments that are supported by the System x3250 M6 server. The following table lists Fibre Channel HBAs supported by the System x3250 M6 server. The System x3250 M6 server has four non-hot-swap system fans. The optional thermal kit helps lower fan speeds depending on the environment's temperature to lower acoustic noise and energy use. The following table shows ordering information for the thermal kit option. The kit contains an additional thermal sensor and a sensor cable. Note: The Thermal Kit does not extend the operating temperature range beyond 35 °C (95 °F). The System x3250 M6 server supports one 300 W AC fixed power supply or up to two 460 W redundant hot-swap power supplies. The power supplies are 80 PLUS Gold certified. Standard and TopSeller models of the System x3250 M6 come with one fixed or hot-swap power supply (model dependent, see Standard models and TopSeller models for details). The following table lists the hot-swap power supply option for models with one hot-swap power supply. A hot-swap power supply option ships standard with one 2.8m, 10A/100-250V, IEC 320-C13 to C14 rack power cable. Standard and TopSeller models of the System x3250 M6 ship without a power cord (except the models 394316A and 363316A). Country-specific line cords or rack power cables listed in the following table should be ordered together with the server. The System x3250 M6 server supports VMware ESXi installed on a USB memory key. The USB memory key is installed in a USB socket inside the server. Important: VMware ESXi and other hypervisor support requires a hardware RAID controller or HBA: M1210, M1215, M5210, or N2215. The onboard ServeRAID C110 controller is not supported by VMware ESXi and other hypervisors. The System x3250 M6 server contains an Integrated Management Module II (IMM2.1), which provides advanced service-processor control, monitoring, and an alerting function. If an environmental condition exceeds a threshold or if a system component fails, the IMM2.1 lights LEDs to help you diagnose the problem, records the error in the event log, and alerts you to the problem. Optionally, the IMM2.1 also provides a virtual presence capability for remote server management capabilities. The blue-screen capture feature captures the video display contents before the IMM2.1 restarts the server when the IMM2.1 detects an operating system hang condition. A system administrator can use the blue-screen capture to help determine the cause of the hang condition. The following table lists the remote management option. The UpdateXpress System Packs (UXSPs) are integration-tested bundles that enable customers to maintain their server firmware and device drivers up-to-date and help them avoid unnecessary server outages. Lenovo XClarity Administrator is an optional software component for the System x3250 M6 which can be downloaded and used at no charge to discover and monitor the x3250 M6 and manage firmware upgrades for them. The System x3250 M6 server models listed in Standard models and TopSeller models come with the rail kit. In addition, an optional lockable front bezel listed in the following table can be ordered for the System x3250 M6, if needed. Processors with TDP below 55 W: 5 °C to 40 °C (41 °F to 104 °F); altitude: 0 to 950 m (3,117 ft); decrease the maximum system temperature by 1 °C for every 175-m increase in altitude above 950 m.
Processors with TDP above 55 W: 10 °C to 35 °C (50 °F to 95 °F); altitude: 0 to 950 m (3,117 ft); decrease the maximum system temperature by 1 °C for every 175-m increase in altitude above 950 m.
The System x3250 M6 has a one-year (Machine Type 3943) or three-year (Machine Type 3633) customer-replaceable unit (CRU) and onsite limited (for field-replaceable units [FRUs] only) warranty with standard call center support during normal business hours and 9x5 Next Business Day Parts Delivered. The following tables list the SAS external drive enclosures that are offered by Lenovo that can be used with the System x3250 M6 for storage expansion. The following table lists the external storage systems that are currently offered by Lenovo that can be used with the System x3250 M6 in IT solutions. The following table lists the external backup options that are offered by Lenovo that can be used with the System x3250 M6 in backup solutions. The following table lists the Ethernet LAN switches that are offered by Lenovo that can be used with the System x3250 M6 server in IT solutions. The following table lists currently available Fibre Channel SAN switches that are offered by Lenovo that can be used with the System x3250 M6 in IT solutions. The following table lists the rack cabinets that are offered by Lenovo that can be used in System x3250 M6 solutions. The following table lists the KVM switches and consoles that are offered by Lenovo that can be used in System x3250 M6 solutions. The following table lists the power distribution units (PDUs) that are offered by Lenovo that can be used in System x3250 M6 solutions. The following table lists the uninterruptible power supply (UPS) units that are offered by Lenovo that can be used in System x3250 M6 solutions.